Last night I had an interesting new patient come into the office. She came into the office in a severely antalgic lean (this means she was hunched forward and bent to side). She came in with her hospital discharge papers and was in serious pain. The type of back pain that required her to take (Vicodin, Percoset, Darvoset and one or two muscle relaxers). She was not even standing upright and was writhing in pain and basically collapsed at the front desk. Now as a Spinal Decompression specialist and a Chiropractor practicing in NYC for over 10 years I have had my fair share of patients coming in with back pain and herniated disc issues. The thing is she was told that she needed a surgery but she refused and left the hospital and came into our office. She was unable to lay down on her stomach, on her side or any other position without screaming in pain (Not the type of patient that you want when new patients are in the waiting room). 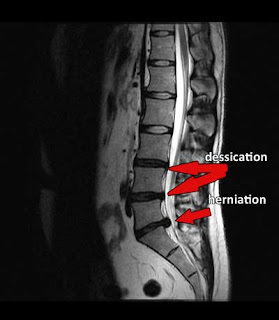 I reviewed her MRI and she had Multiple disc herniations from the second Lumbar down to the fifth Lumbar. She was interested in Non-surgical options. Tomorrow is her first visit on the DRX 9000 spinal decompression table, I look forward to helping her and seeing her walk out of the office feeling better. This is not going to be a particularly easy case. The nice thing about the DRX 9000 is that it starts in a vertical position and slowly brings the patient to a horizontal position and when the treatment is done it returns the patient slowly back up. Another great tool that I will use is the Cox flexion distraction decompression table. Cox Technic is performed on a specially designed chiropractic instrument (The Cox Table for flexion-distraction) which has a movable headpiece and a movable caudal piece (that part on which a patient's legs lie). Each section flexes, extends, laterally bends and circumducts (combination of flexion and lateral flexion), and long-y-axis plane distracts. Once the patient is better and in less pain I use the SpineForce to Rehab the muscles and supporting structures.